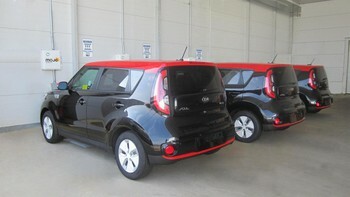 Kia seems to be ramping up in New England. Added L2s in Warwick RI and Framingham MA, and Framingham shows 4 Soul EVs in stock. Previously only 2 dealers south of Hartford CT carried them. A pair of leaked documents from Kia indicates the brand is fitting a 30-kilowatt-hour battery in the Soul EV as a replacement for the existing 27 kWh pack, according to Kia-World. The model’s electric motor continues to produce 109 horsepower (81.4 kilowatts) and 210 pound-feet (285 Newton-meters). 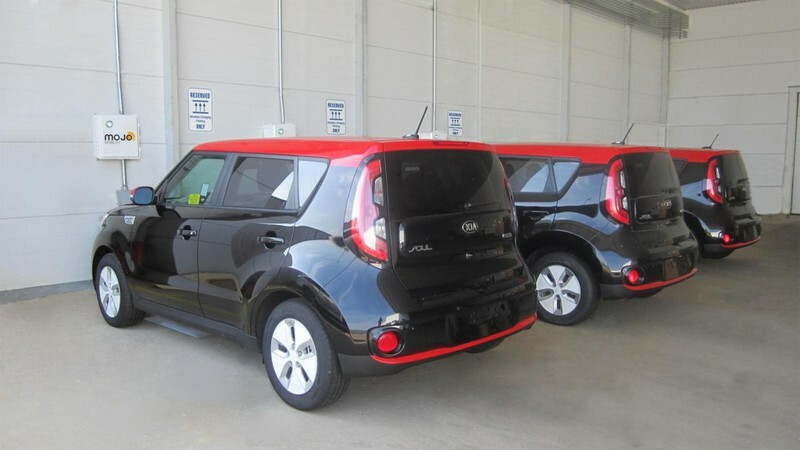 According to one of these documents, Kia reports the larger battery boosts the model’s range in the Korean testing cycle to 112 miles (180 kilometers) – versus 92 miles (148 km) currently. A leak from a dealer in Germany indicates the Soul EV would be able to go 155 miles (250 km) based on the New European Driving Cycle’s evaluation – as opposed to 132 miles (212 km) now. . . .
EPA currently rates it at 93, which is where IEVS' 113 estimate for the new pack comes from. Not enough, IMO - I think ca. 125 miles/200km EPA at the same or lower price is the new lower limit that is acceptable to a reasonable number of consumers. I'm thinking this capacity improvement must be a stopgap measure until the Niro EV is ready in 2018, at which point the Soul EV is likely to be scrapped. The Niro shares its structure with the Ioniq, so we know that a 31 kWh (28 usable) pack fits in the car now and Hyundai has been very vocal that a capacity bump is coming by mid 2018. I expect a 40 kWh Niro EV will dovetail with the cancellation of the Soul EV. The products are too similar. The 2018 Soul EV's range has been certified by the EPA at 111 miles. Combined MPGe has risen from 105 to 108 MPGe and consumption drops from 32 kWh/100 miles to 31 kWh/100 miles. A large part of the range increase was the deletion of the 80% charge option; if this option is present then 80 and 100% SOC will be averaged for the window sticker number. As such, the '15-'17 Soul EVs would have had a 100% SOC EPA range of ~103 miles. The '17 Soul EV omitted the 80% charge option but Kia didn't pay to have the car recertified until the '18 model year. ,,,Yes. They have removed the 80% option and that accounts for some of the change. But the real changes are equally / more important. Update on the soul forum RE indicated capacity loss. Remember, these reports are only of BMS data, with no confirmation of accuracy. ...There are 2 cars on this thread doing amazingly well, but the other 20 are all doing much like mine (see chart at link, ~10% average capacity loss in ~30k miles) We are not going to get a new battery under warranty. But if the line stays linear we are only just going to go over the 10 year 160,000km warranty limit. I still assume though that it will degrade less as the car gets older, primarily because you won't drive so far, or so fast. It is becoming very clear though that the users on this thread are unusual in that we are all looking after our battery health. I have seen / heard numerous reports from USA / Canada / South Korea of cars with very serious battery degradation. These users do the opposite. Charge to 100%, drive like they stole the car, often down to the very bottom of the battery. These batteries are being replaced after 2 or 3 years. Oh thanks for the link! I didn't realize they had updated the Souls and it's always fun to look through the data. I suspect the Wh/mi variance has everything to do with the Soul being shaped like a brick. The Soul's TMS is a cage fan pulling a small amount of cabin air through the pack after the temperature sensors reach a given threshold and/or when quick charging in high ambient temps. I can't imagine, based on what I've witnessed, that it consumes more than 50 Wh for an entire charge/discharge cycle. It increases the HVAC load a little bit too, but I suspect it would be hard to measure. Pretty good cooling bang for the buck. I expect this would have only minor effects on pack temperatures. Air is an excellent insulator, but a lousy conductor of heat. The Soul's ~26% larger battery pack may give more benefits in limiting heat build-up, by allowing more efficient lower kW/C rates during both charging and discharging. And (hopefully) their newer batteries will prove to be a bit more resistant to heat degradation than are the LEAFs' are. Of course, larger pack cost/benefits cut both ways. In terms of absolute capacity loss, the larger Soul batteries may be losing more Wh over ~the same time and miles driven than the LEAFs are. The two 2103 LEAFs which baseline at ~500 miles, with one summer of use averaging ~15.5 k miles over just under 15 months, show ~15.3% average capacity loss, or ~3.7 kWh average. The three 2015 Souls which baseline at ~400 miles, also with a different summer of use averaging just under 12k k miles over just under 11 months, show ~10.5% average capacity loss, or ~3.2 kWh average. I don't see that very preliminary data, showing slightly over 1% capacity loss per month for the LEAFs, as compared with slightly under 1% capacity loss per month for the Souls, a great achievement for Kia. If I were to venture a guess, it looks to me like 2015 Phoenix Soul drivers may reach average 70% EOL capacity only a few months longer after delivery, than 2013 Phoenix LEAF drivers will. This has been discussed on the Volt thread. Yes, if you don't use a PHEV's batteries much, and are willing to run the ICE generator to provide energy for battery cooling, even after the pack is discharged, batteries will last a lot longer than they will in a BEV, especially in Phoenix. Those Volts were driven mostly on gas, and averaged an unimpressive 39.3 mpg. Meaning hybrid ICEVs driven over the same routes probably could have used about the same amount of gas, without ever plugging them in. Just a waste of both the battery pack and all the kWh used in charging, for a PHEV used in this application. South Korean media reports that the third generation Kia Soul is coming this year and that includes an electric version that goes at least 186 miles per charge. The new Kia Soul EV will be based on the common platform that was developed for the Hyundai Kona Electric and Kia Niro EV Concept. That means some 186 miles (300 km) of range will be offered! Will it get the Kona’s base 39.2 kWh battery? Seems likely, but will the even bigger 64 kWh pack from the range-topping Kona be made available too? We can hope. . . .
Etnews.com reports that the third generation Soul will be launched in the second half of 2018. Whether it means that the electric version will go on sale soon after is unclear right now. We expect that together with moving to a new platform, Kia will also abandon CHAdeMO and offer CCS Combo fast charging inlet. . . . Assuming the last point's correct (I expect it is), other than the LEAF and Mitsubishi Outlander, which cars will still be using CHAdeMO?
. . . The three-year project — a partnership between the Hyundai-Kia America Technical Center, wireless charging company Mojo Mobility and the U.S. Department of Energy's Office of Energy Efficiency and Renewable Energy (EERE) — culminated in the system being equipped to five vehicles and tested in real-world environments. The system uses electromagnetic fields transmitted between a transmitter coil on the ground and a receiver on the bottom of the car to transfer energy. It can charge at over 10 kW, with 85 percent grid-to-vehicle efficiency. . . .
Kia is not making any promises to customers yet, though. "There is no current plan to offer the wireless charging system on production vehicles for sale to consumers," Kia stated in its press release, "however, the success of this development project suggests similar systems are possible on future Kia electric vehicles." As stated in the article, wireless charging and AVs go together like peanut butter and chocolate, and while some private owners may be willing to plug in to avoid the extra losses, I fully expect that we'll see this on car-shared AVs that can drive themselves to charging sites. This story is over three years old. It began in July 2014.
. . . New spy shots hint at more than just styling. . . .
For instance, it could offer over 250 miles of range. Now, some new spy photos indicate this will indeed be the case. And it makes sense, seeing as it will be built on the same platform as its corporate cousin, the Hyundai Kona Electric, as is the larger Niro EV.One shot, in particular, is revealing and shows a range reading of 437 km (271.5 miles) on the display with 92 percent of a full charge. Putting two and two together, we imagine the Soul should score at least as high on the EPA test as the Kona Electric, which was given a 258-mile rating. The spy shots also give us the best idea yet about the appearance of the next-gen Soul EV. It certainly seems to retain many of its former styling cues and should be pretty recognizable as a Kia Soul EV. If, as is rumored, it comes with an all-wheel-drive option, then it may actually become a pretty hot commodity. At least, it will if priced right and built it in large enough numbers.